In the heart of the Santa Ynez Valley on two peaceful acres with mountain views, close to wineries, restaurants, theater, casino, golf courses, shopping, bike path and YMCA. Cozy rooms and suites for romantic getaways, some with hot tubs, some kitchen rooms and suites for families and extended stays. Non smoking, equipped with cable tv, wireless, phones, coffeemakers, fridges, hairdryers. 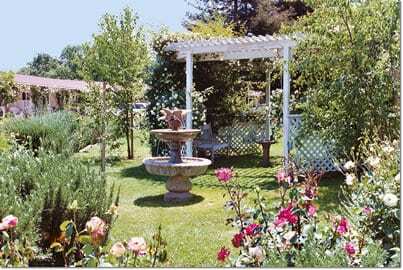 Small pool, expansive lawns and picnic tables among giant oak and redwood trees. Customized winery tours, spa services, concierge services, light breakfast.